For designers, to see their work as a final, completed printed piece is very rewarding. Many hours of hard work, comps, and countless PDF proofs culminate in that “midnight press check” at the printers, or those high quality samples that the account executive is proud to present. A designer who appreciates and takes time to understand the print process can provide their clients with the kind of value-added knowledge and design capabilities to print and finish successfully. “Modern” print is attributed to Johannes Gutenberg, who used print to publish the German Bible, which was a contributing factor in the Reformation of the Church in Europe. Gutenberg’s technique of pressing a sheet of paper to ink-covered type forged the basis of terms we still use in print today. “The press”, “typesetting,” and various other terms associated with typesetting, have their origins in Gutenberg’s work. 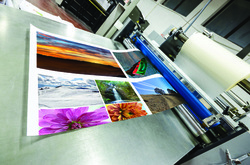 Print continued to evolve, using photographic techniques to “shoot” art boards that were created by graphic artists. This high-contrast “litho” film was then assembled in pre-press. Today, graphic artists work in the “desktop environment,” using InDesign, in conjunction with Illustrator and Photoshop, to create complex files that could never have been done 30 years ago. Paper is a crucial variable in print, giving the option of coated or non-coated surfaces. It can be smooth, or super smooth, with a light texture, or a heavy, mill-applied texture. Paper has a tremendous impact on print, particularly if you pick a sheet that has texture on it, or has a color or shade. Paper also comes as recycled sheets, or as “virgin sheets. “ Recycled sheets can have varying degrees of post-consumer waste features. Virgin paper is made directly from tree pulp. However, recycled paper can be more expensive than virgin paper due to the process of turning the recycled material into paper pulp. TIP: paper mills such as Neenah and Mohawk (both US-based mills) have wonderful samples and swatch books, so don’t hesitate to ask for them when designing a piece for a client. Ink- Put simply, ink is what you see when you look at a printed piece. For color work, presses run a sequence of the colors cyan, yellow, magenta and black. The acronym used for that is CMYK: Cyan, Yellow, Magenta and blacK. Black was called the “key” color, which is why it keeps the “K” for its designation. Ink can also be run in spot or PMS (Pantone Matching System) colors. PMS colors use very specific formulas so that they can be standardized across all platforms throughout the world. You, the designer, create a wonderful piece to run on a nice 100# smooth, uncoated cover, with solid PMS colors, and images in CMYK. You teamed up with the print services provider for paper selection, and are viewing the final proofs. Now the print process can begin. Each CMYK color has its own printing plate, and the really nice, solid PMS has its own plate as well. The press has five printing units, one for each color. The pressman takes each plate and mounts it into the print unit, each plate corresponding to the color in the print unit. The pressman then loads up the paper in the feeder end of the press, loads the ink into the ink fountain, and begins to run a few sheets through. He then examines the press sheets, making sure that the colors line up correctly (called “registration”), and that the ink for each color is at the correct, standardized density. The pressman then checks the proof to the sheet, makes adjustments to the ink colors as needed, runs a few more sheets until he is satisfied, then he starts to run the job. That whole process is called “make-ready,” and can take 30-60 minutes to complete. Clients will often be at the press at the end of this process, and ask for adjustments to color to get to what they want. Once approved, the pressman continues to monitor the density of the ink, and can adjust it on the fly as the job runs. This process is repeated for each side of the press sheet over all press forms until the job is complete. As you can see, there are many elements in the printing process, with paper and ink being the primary ones that affect how the piece will be printed. Seek out a printer who has a good reputation for quality, and provides you with information to help better educate you in the process. That way, both you and your printer can successfully produce wonderful and exciting printed materials.